Hi all! When I saw these polishes standing next to each other I knew I had to combine them somehow. A gradient came to mind, and taped stripes on the side of my nails, but I wanted to add a glittery accentnail for a change and I thought the horizontal stripes would work best. So here you have it :) I'm liking it more irl than on my photos I have to say, and it's fun to wear with the glitters and all! But next time I'd go for vertical stripes again though, it's a bit thicker on my tips than I'd like now. 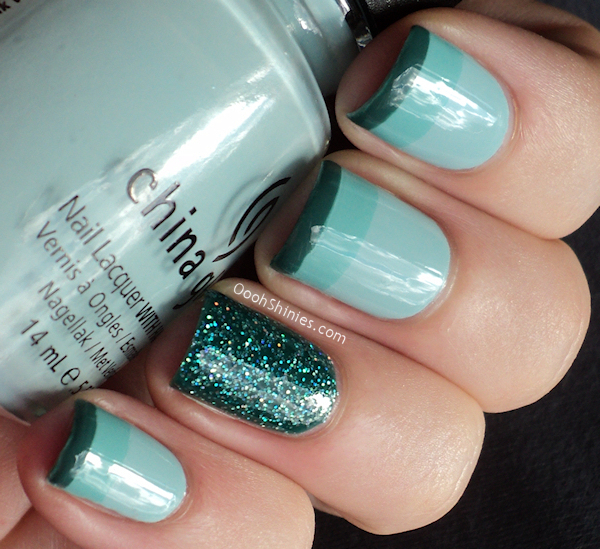 China Glaze Kinetic Candy, For Audrey and Exotic Encounters with an accentnail of Exotic Encounters and Atlantis. Thanks for looking and enjoy your Sunday!